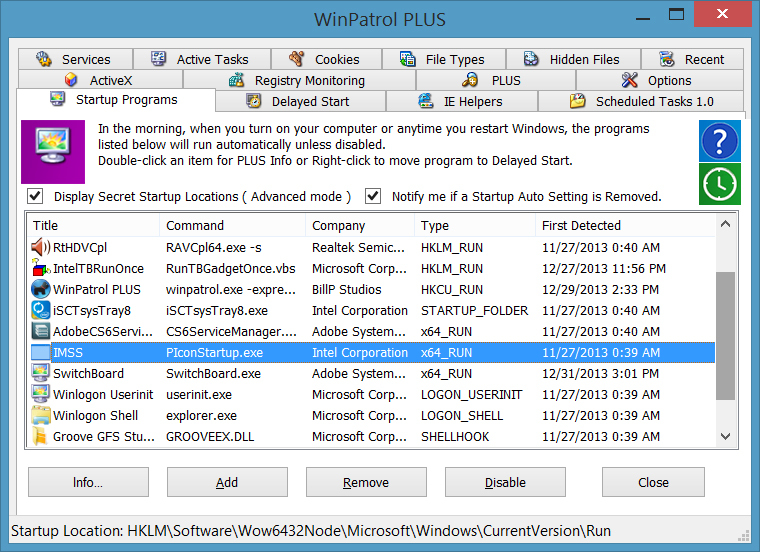 WinPatrol takes a snapshot of key system areas and then alerts you whenever a program tries to make significant changes. The program monitors your startup programs, ActiveX controls, IE addons, file associations, HOST file, Windows update and UAC settings, and more. This isn't enough to stop a serious virus attack, but it will alert you to the behaviour of many spyware and adware programs, as well as regular software that just likes to install a lot of junk. And this monitoring requires very little in the way of system resources. On our test PC the background WinPatrol process required only a little more than 3MB of RAM, and the main program only needed about 6MB. WinPatrol also comes with many useful system management features to help you clean up and manage your PC. It can automatically remove the cookies that you specify, for instance, remove IE helper objects, or delete scheduled tasks. You're able to check your Windows startup programs, and remove any that are surplus to requirements. And a Delayed Startup tool accelerates your boot time by delaying the launch of non-critical startup programs. You may need iTunesHelper.exe to sync your iPod, for instance, but it doesn't have to launch the moment you boot. Tell WinPatrol to launch programs like this 30 seconds or a minute later, there will be less competition for resources at boot time, and your desktop will appear more quickly. This version of WinPatrol is free. If you want more, though, there's a WinPatrol PLUS version that adds a knowledgebase (details on running programs, for instance), "real-time infiltration detection" for better security, increased program performance, and more. It's yours for a one-time fee of $29.95. - Fixed addition of Startup programs to be compatible with recent changes to Windows 10. - Fixed removal of Startup programs to be compatible with recent changes to Windows 10. - Disabled and removed checkbox for “Allow PLUS info data collection” because recent changes in allowed -- - URL length resulting in no data being returned for customers. One of the best system maintenance tools on the market. Even the free version is an essential tool for most users. Not that useful for Win 7/64bit.Good bits have to be purchased.Besides Win7/64 has most features built in.A no for me.